Kent bowed out of the Travel Plus Tours National League Play Offs to league toppers Mildenhall – beaten heavily on aggregate but running the champions-elect closer than any other side has managed this term, going down on the night by just two points in a last heat decider. The match started in sensational style. 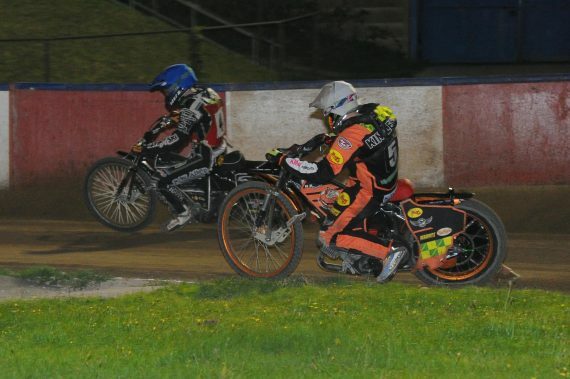 The visiting pairing of Drew Kemp (surely destined to be a huge star at the very top of the sport) and Ryan Kinsley roared from the start establishing what seemed like a nailed-on heat one maximum (potentially demoralising for a Kent side already facing a numbing 32 points deficit from the first leg). Anders Rowe though was having none of that – riding in inspired fashion, he took Kinsley with a brilliant inside pass on the second lap and then astonished the crowd by repeating the feat on the final bend of the third lap over the Fen Tigers young number one Kemp – roaring on to record his fastest ever race winning time. This entry was posted	on Tuesday, October 2nd, 2018 at 9:00 am	and is filed under Featured, Other Sports, Speedway. You can follow any responses to this entry through the RSS 2.0 feed. Both comments and pings are currently closed.